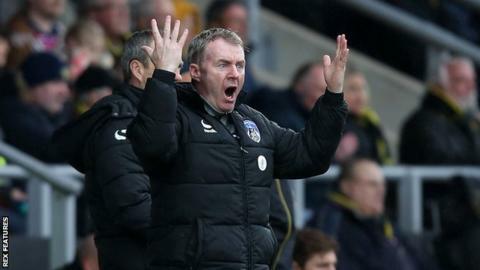 Oldham have said they have not received an approach for boss John Sheridan after reports that he will take over at League Two side Notts County. BBC Radio Nottingham are reporting that Sheridan is set to replace Mark Cooper, who left the club on 9 May. Sheridan, 51, was linked with Notts County in January before the League Two side appointed Jamie Fullarton. The Oldham boss previously worked with Magpies chief executive Jason Turner at Newport County. Fullarton was sacked after only 70 days as manager at Meadow Lane and Cooper took charge for the remainder of the season, but left to take over at Forest Green Rovers. Former Leeds United and Sheffield Wednesday player Sheridan began his managerial career at Oldham before moving on to Chesterfield, Plymouth and Newport. He was in charge of the Welsh club from October last year to January, winning five of his 17 games, before returning to Oldham - where he has a year left on his contract. Notts County have been up for sale since March when owner Ray Trew announced he was stepping down as chairman.